In Detroit, The Chevrolet Cruze has been announced as the finalist car for its high-status World Car of the Year Award and the finalist car for the World Car Design of the Year Award goes to Chevrolet Camaro. The list of winners will be announced at New York International Auto Show on April 1. 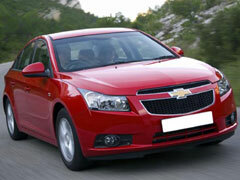 A jury of 59 International Automotive journalists, nominated the Cruze from for the top 10 finalist cars of the World. This selection is based on their vast experience and a line of professional work records in the field of automobiles. The jury comprises of pure professionals from all major continents to keep the balance in view and reviews. The jurors are still evaluating the Top Ten Cars of the World to line up for the final voting being held in February. They will rate the vehicles on its value, environmental friendly, safety, its outer look and its technicalities. Chevrolet Cruze has already coming in top 5, as it is gaining the major voting by the experts and from the European countries. In the design category, the Chevrolet Camaro is short listed to top 4, for the finalist of World Car Design of the Year Award. It is recommended and suggested by the 59 experts, with their combined opinions. According to Yahoo! Camaro was the keyword that was searched the most in the year 2009.